Out of this passion for races the idea has been born to develop an electric Kart, that would have the same or better performance as a petrol Kart. 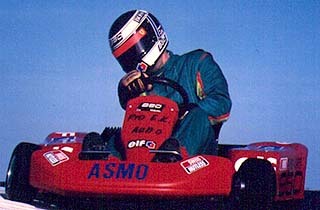 Since 1994 ASMO Engineering AG has sold Karts to tracks all over Europe, Canada and the USA. Indoor karting is experiencing a "Boom". The Kart business has proven to be very rewarding to track owners. Most of the Karts are still driven by petrol motors, but as customers and lawmakers are more sensitive to such issues as environment and health, running a conventional track is becoming more and more difficult due to restrictions of permits, insurance fees and liability. Our company has found the alternative, a system that is not only quiet and clean but is also stronger and more efficient. The advantages are not only that permits are easier to get, but also the higher safety standards. The low center of gravity prevents overturning of the kart and the dry lead batteries do not endanger the driver with acid even in case of a heavy crash. In addition, driving is a thrill. Instantly high torque gives an extremely fast acceleration, and the kart proves to be not only as fast as a conventional kart but even faster. Read more Arguments, why Electric Karts will give your Business a Real Advantage! From our experience we can assists you to design an successful and cost effective Kart Track.